Tomato and most vegetables are low humidity loving plants which is the major feature of dry season. This is the reason why the bulk of tomato production in the country takes place during the dry season mostly in the North. Sadly enough, there is usually a dip in price around this period due to astronomical increase in supply of tomato type locally known as “royal” (This name is attributed to round or oblong shape tomato fruit rather than variety). On the other hand, production of tomato during the wet season poses so many challenges to growers as a result of diseases and insect infestation. Coin-incidentally, price per unit quantity of “Royal tomato” is usually on the very high side due to dip in supply. In reality, supply of this type practically comes to zero from the North which produces over 95% of this during the dry season. What replace this “royal type” in the market during the wet season are the local varieties with poor attributes and financial returns. The question now is; is it still possible to produce this “royal type” of tomato during the raining season to take advantage of the supply dip? Yes it is! Knowing what to do and how to do it are the only secret to successful outcome. 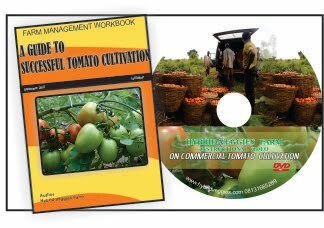 Watch Our Instructional video on commercial tomato cultivation!!! Read more on our resourceful materials that would surely make you a pro in wet season tomato cultivation!!! 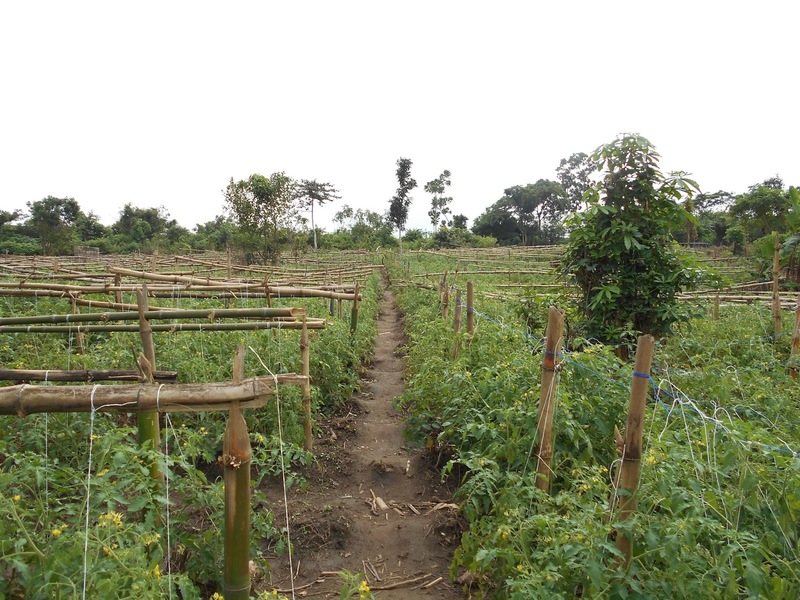 Making attempt to plant ‘royal’ tomato during the wet season without choosing the right variety would surely result into loses. Therefore, the corner stone of foundation to successful cultivation of tomato during the wet season is choosing the right variety. There is no other variety in this class than this Padma f1 which was specifically breed for tropical low land and wet season (high humidity) period. Come along as we explore the uniqueness of this wonder variety. Resistance: Bacterial wilt is a major disease of solanaceous family which tomato belongs. This disease is prevalent in wet soil and can be very destructive. The uniqueness of this variety is that; it has intermediate to high resistance to bacterial wilt, fusarium oxysporum sp. and tomato mosaic virus. These are the major diseases associated with wet season and in Padma f1; you have refuge from them. Adaptability: Padma f1 has good adaptation to warm and humid growing conditions (which is particularly common in Southern part of the country). Plant vigor is moderate to strong. Excellent performance in tropical lowland rainy season. 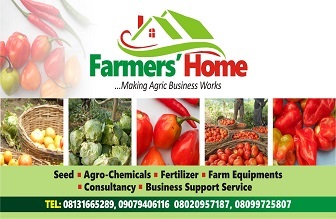 The variety has been used either on demo farms or large commercial fields in any part of the country and it has indeed proved its adaptability. Please, never commercially cultivate any tomato seed variety that has never been grown successfully during the raining season in this country. High yield: The weight of its average fruit is usually between 90 – 100g and yield per stand can be far above 5kg. However, this would not come naturally without strict adherence to rigorous nutrient feeding protocol. Long shelf life: The shelf life of Padma f1 is a much as 2 weeks if harvested greenish red. You may want to store for some days before taking it to the market and doing this would not pose any problem provided it is done in the right way. Padma f1 and its accomplice: The Seven Must Do! Lastly, if you are still in doubt, just give it a trial and you would never regret doing this. Remember that in veggies farming, it is never a wise decision to always go for cheap seeds with cheap genes! CONTACT: Greenfield Evergreen Resources Company for more info. Office address: Suite 23, Adamasigba Stadium, Opposite Bureau D Change, Sabo (on the way to Danas), Mokola Roundabout Ibadan, Oyo State. Visit our resourceful site www.hybridveggies.com to get the best practically oriented farming techniques. Watch Our Instructional video on commercial tomato cultivation!!! There are many varieties of cucumber in Nigeria from different seed companies, some are good but one stands out due to the reason underlined below. Deep Greenish plum fruit: Greengo f1 has one of the finest deep greenish colour of fruits you can find in Nigeria. Asides, it produces averagely equal sized fruits that are plum which enhances its package-ability. Dioecious: Cucumber by nature is a monoecious crop but Greengo f1 is a dioecious. What this means is that it is similar to local papaya plant that has male and female flowers on different plant stands. In other words, out of ten plant stands, one could be male and the remaining nine, females. Mostly in ration 10:1, the few male plants stands are expected to pollinate the very many female plant stands with the help of beneficiary insects/winds. Resistance to weather changes: Cucumber plants often respond to day length, heat, time of the year etc. This changes in environment causes cucumber plants to mostly produce predominantly male flowers with few female flowers resulting to potentially poor yield. Having an exclusive female plant stands from a diecious crops like Greengo F1 has solved this problem - A female plant would always be a female plant. High yield: This is one of the benefits of planting only dioecious seeds. Since the ratio is mostly 10:1 in favour of predominantly female plants, you have potentially high yield every other thing being equal. Market sentiment: The fresh veggies markets are predominantly disposed to deep greenish cucumber fruits especially in Southwest Nigeria. You have a better unit price from planting this type than the light greenish ones. 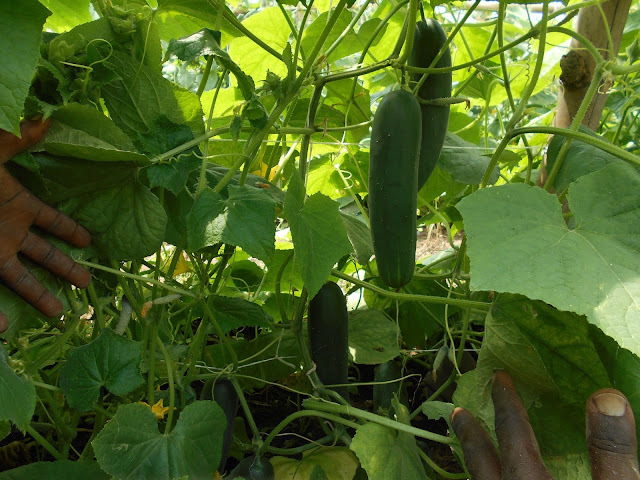 Resistance to Downy Mildew: This is perhaps the major threat in cucumber cultivation especially in raining season. There is no degree of preventive measures you can take to stem this infection if the variety in the first place does not have intermediate to high resistance to mildew. Greengo f1 has a very strong resistance to mildew even without preventive measures (though not wise). Long shelf-life: This cucumber variety can stay for a week without depreciating in colour or firmness. Only few varieties if any can equal this. This is perhaps an attraction to both retailers and consumers. Lastly, if you are still in doubt, just give it a trial and you would never cultivate other varieties of cucumber again in this class. Remember that in veggies farming, it is never a wise decision to always go for cheap seeds with cheap genes.